Refuse to become a victim. 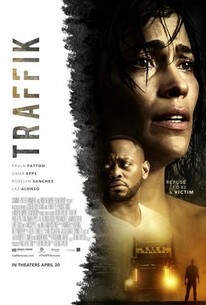 That’s the tagline of Deon Taylor’s new film Traffik. You ever feel like you’ve been okey doked? There’s a lot of weight in that tagline. It screams survival, defiance, fight. Yet, the film is the definition of a slow burn thriller. Once the film takes off, it’s a fun ride, but it takes far too long to get there. 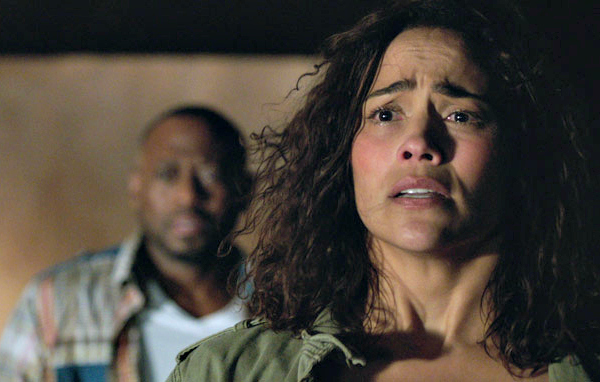 Brea (Paula Patton) and John (Omar Epps) decide to get away for the weekend by going to John’s buddy Darren’s (Laz Alonso) vacation home in the secluded northern California mountains. On the way up, the couple has an unpleasant interaction with a racist biker gang when they stop at the local gas station. While John has a verbal and physical exchange with one of the bikers outside, Brea unbeknownst to her, receives a phone from Cara (Dawn Olivieri), a woman who appears to be in danger with her biker boyfriend, in the restroom. While the exchange in the restroom didn’t send off a red flag in Brea’s mind. It finally goes off once the phone starts ringing later that night. Now joined by Darren and his girlfriend Malia (Roselyn Sanchez) at the house, the foursome unlock the phone to discover a secret that could cost them their lives. Especially, when the bikers come looking for their phone. The biggest issue with the film is that it takes almost half of its running time to get started. There is a lot of exposition in the beginning. Characters establish how wonderful another character is or isn’t through lengthy dialogue. Brea and John stop randomly on the ride up the mountain to make love in the car John built from the ground up as a birthday present for Brea. Brea debates and compares notes with Malia whether she wants to take the next step with a man who seems to be proving himself at every turn. It’s these random pit stops in the script’s attempt to verbally over-talk us into caring along the way to the big event that detract from the story. However, once the biker gang comes to retrieve their phone, the film really takes off. Cinematographer Dante Spinotti paints the first half of the film with a glamorous hue, and switches to limited, natural lighting when it’s time for the characters to survive. Scenes are lit by headlights, or lamps in a home. The lighting really pulls you in to the intensity and solitude being exhibited in the film. Taylor has a way of building the suspense in the film visually by establishing the space of locations and then using the frame as a peak into what’s happening. The performances in the film are serviceable but certainly not memorable. While the film’s title alludes to human trafficking, it touches on it, but feels more like it’s using it as a background plot device within the film. Which leads me to my opening point in that the film doesn’t really give what it’s selling. I ultimately enjoyed the survival portion of the film. This is the type of film that you want to see with someone else so that you can yell at the screen and tell Brea and John what to do. It’s the type of film that you lean over to your spouse and say “make sure you shoot to kill if we’re ever in a situation like this.” It’s the type of film that will give you 96 minutes of escapism while viewing, and you’ll forget about it next week. Know what you’re getting into when you enter and you’ll have a good time at the movies.